With the busy lives we lead, it’s no wonder that more homeowners are finding a contemporary-style kitchen meets their needs. Once considered bland and sterile, today’s contemporary kitchens are bold, stylish and showcase modern appliances. They are also functional and easy to maintain which, according to the 2014 National Kitchen & Bath Association Design Trends Survey, makes them one of the hottest trends in kitchen design. Horizontal lines are a key feature of contemporary design. Horizontal lines are used in the style and layout of cabinets, flooring, backsplashes, lighting and even ceilings where crown molding, beams and trusses are part of the kitchen. Contemporary kitchen with a linear layout. Horizontal lines are used in the lighting, cabinetry, cabinet trims, layout of the flooring and accent tile in the backsplash. Industrial elements have always been incorporated into contemporary design. In kitchen design this means wood, stone, concrete and metal. Stainless steel appliances. Smooth stainless steel finishes on appliances create an industrial look. 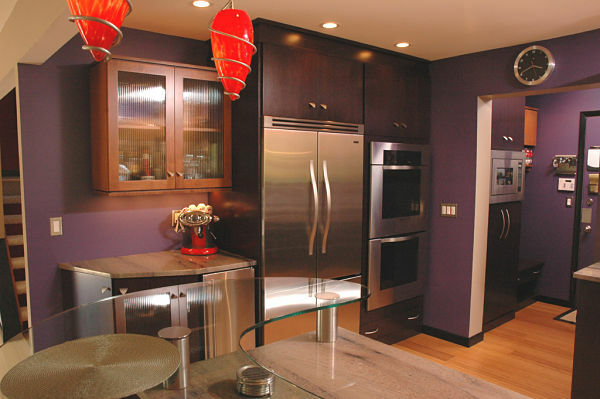 Many homeowners who love contemporary design select commercial appliances for their kitchens. One appliance that can add a contemporary flair and serve as a focal point is the range/cooktop vent hood. Metallic finishes. 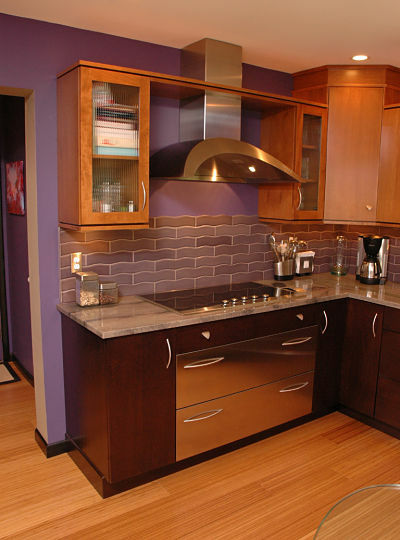 Metallic finishes are not limited to appliances. Light fixtures, sinks, faucets, hardware and furnishings echo the industrial theme. Contemporary kitchen with industrial features reflected in the selection of the vent hood, refrigerator, pendant lights, sink, faucet, hardware, chairs, cabinets and styling of the ceiling. Utility and function are important in contemporary design. Flat door frameless full-overlay cabinets optimize interior storage space. The flat fronts of doors and drawers are easy to wipe down. 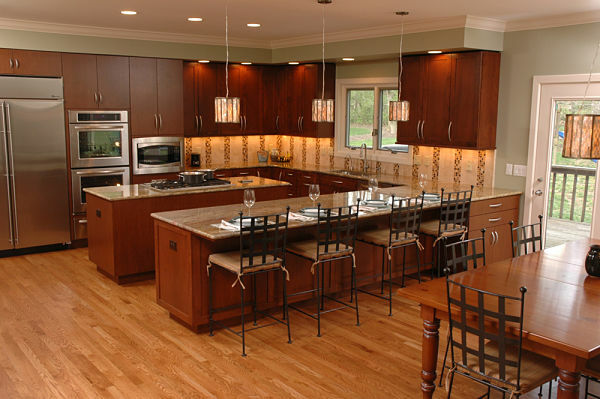 Craftsman style cabinets with simple clean lines are also popular in contemporary kitchen design. 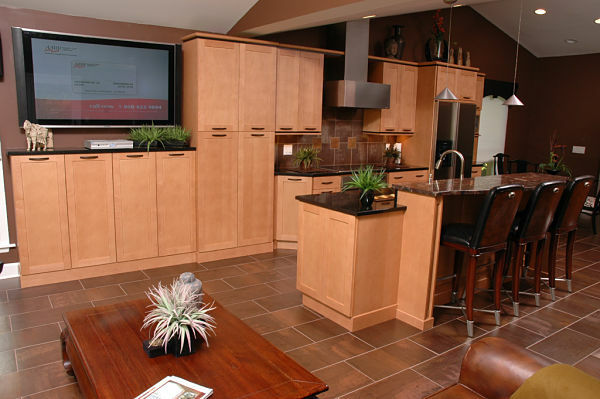 Full-overlay flat front cabinets in a dark wood finish trimmed with light wood molding. Sleek oversize pulls provide an accent. Sculptural elements add interest to the clean lines of contemporary design. In addition to squares, rectangles and globes, consider the impact of curves and hexagons in the design in planning counters and backsplashes. This kitchen design includes a variety of geometric shapes in the curves of the vent hood, backsplash tile, and pulls, triangular knobs, hexagonal shape of the corner cabinet and the curve of the glass counter in the foreground. In contemporary kitchens of the 1980s we saw a lot of laminates and oak trim. Today, designers favor the use of natural materials with smooth finishes. Wood. Wood is used in cabinets, trims and flooring. Cabinet finishes can be combined to add interest to the room. Stone. Granite counters continue to be popular. One of the products more designers are using in contemporary kitchens is honed granite. 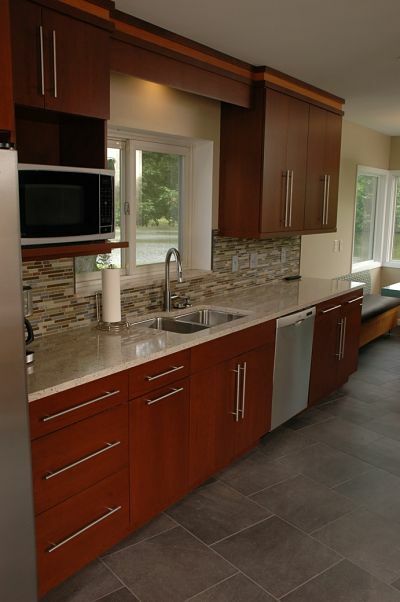 Honed granite has a matte finish that reduced reflective glare in a kitchen and accentuates the natural look of stone. Glass. Glass counters and glass on cabinet doors add to the style and function of a contemporary kitchen. Dual height counters often feature a glass counter for informal dining. Glass doors on cabinets with interior lights add a source of accent lighting to the room. Natural elements are used in this contemporary kitchen. Cabinets are wood with both dark and light finishes. Glass is used on the dual height counter and cabinet doors. Granite was used for the primary counter surface. Contemporary kitchens are not bland. Color can be your personal statement. Consider the color wheel to find the right room colors for your project. Color context refers to the way colors are used with other colors. Color can be used in a variety of ways. Monochromatic. Monochromatic rooms use one main color throughout but values of that color can be varied to create interest and highlight architectural features. Varying values of turquoise were used in this contemporary kitchen to highlight the architectural features and work areas. Orange is the complementary color of turquoise on the color wheel and was used as an accent. Analogous colors. Analogous colors are colors that are next to each other on the color wheel like violet and red. 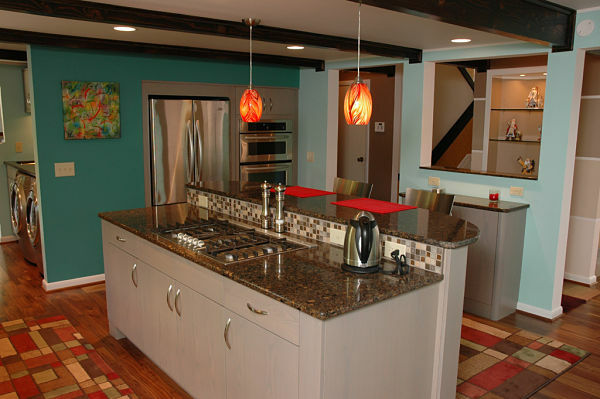 Analogous colors were used in this open concept home. The kitchen space is violet and the dining area red. Beige was used to buffer the colors. The flooring serves to define the spaces. Complementary colors. Complementary colors are on opposite sides of the colors wheel like blue and orange or yellow and purple. 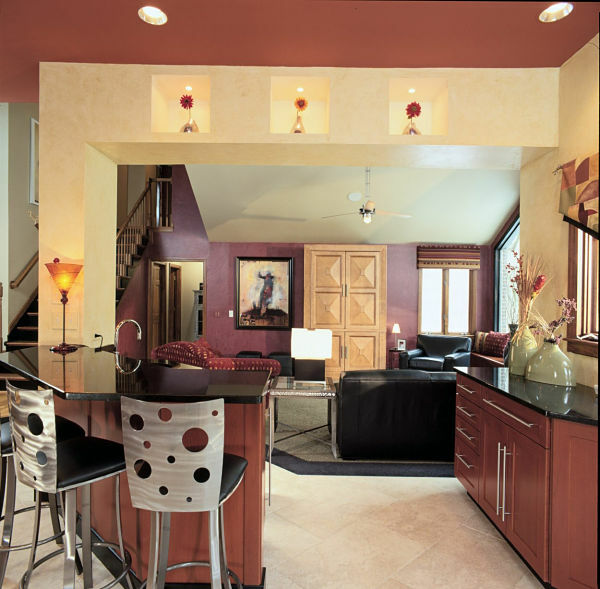 This open floor plan uses complementary colors, (yellow and purple) and analogous colors (red and purple) to create a lively aesthetic design. Light fixtures can be a “wow” factor in contemporary design especially if the fixtures contrast with simple clean lines. Selection of furnishings such as stools and tables, are important to the look of the room. 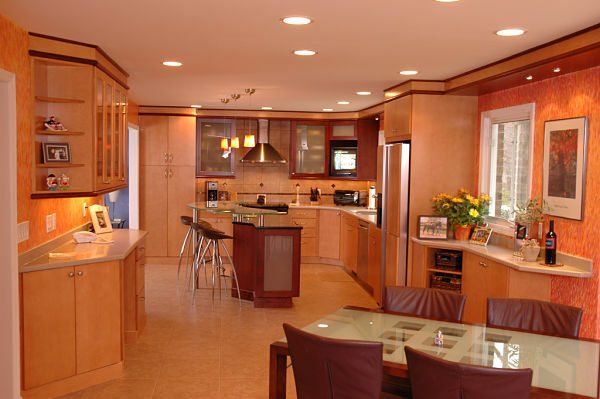 Light fixtures and chairs provide a focal point in this large contemporary kitchen. A simple farm table that matches the finish of the cabinets was selected for the dining area.